I live in New England where it stays cold until the end of the spring season. So I know my sprinters, jumpers and hurdlers will be practicing and competing in the cold, wind and snow. Since using distance runs, long/slow intervals and other methods of high volume, low intensity training do not prepare speed/power athletes for success, how can we approach cold weather training in a way that addresses our athletes’ needs without compromising intensity or increasing the potential for injuries? 1. Spend more time warming up. Treat the warm up as the start of the workout, not the activity which precedes it. Your athletes must develop a similar mindset. Everything we do in practice ties into the overall of theme of that day’s training. If we are working on acceleration, all the ‘activities’ (i.e. the warm up) that precede the ‘workout’ (the sets and reps on the track/runway) relate directly to the mechanics and posture required to have an effective cold weather training session. After addressing administrative issues as a team, all of our practices begin with a compatible and complementary dynamic warm up. Generally speaking, our ‘warm up’ takes approximately 30 minutes to complete, sometimes longer. The activities progress from slow to fast, simple to complex, general to specific. Many coaches fear high intensity activities in cold weather training for fear of pulls and strains, especially with sprinters, hurdlers and jumpers. And this is certainly a valid concern. Simply put, we, as coaches, must spend more time and effort designing and implementing specific warm up routines. 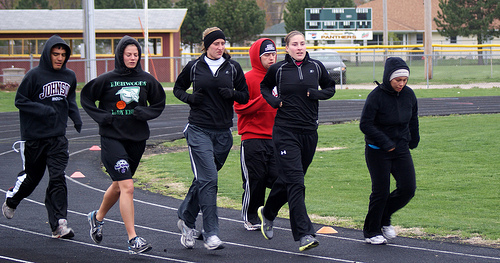 If we do, there is no reason our athletes can not engage in intense, technical activities even in cold weather. Improper hydration – Athletes simply don’t drink enough water. Instruct your athletes to try to drink one gallon of water every day. Poor mechanics – Sprinting and hurdling are highly technical skills. If coaches do not specifically and consistently teach and cue proper mechanics, athletes will place great strain on muscles, joints and tendons. Inevitably, an injury will occur. 2. Reduce the rest intervals. For longer speed endurance and special endurance runs, rest periods generally range from 8-15 minutes between each repetition. That said, on a particularly cold or windy day you may feel that athletes will cool down with that much rest and therefore put themselves in a position to get injured. For my 100/200 types running 30m sprints, I’ll cut the rest down to one minute and run the 30s in sets of 3-5′ with a longer, active rest between sets. Just remember this changes the effect of the workout. Your planned acceleration development has become an alactic speed endurance workout. So you’ll have to modify the rest of the week’s training accordingly. For my jumpers who were supposed to do full approach runs requiring longer rest periods, we’ll now do short approach jumps/pop ups placing less strain on the muscles and allowing for shorter rest periods. For my 400 types who were supposed to run 3x250m @ Goal Pace with 10-12′ rest, we’ll cut down to 6-8×200 @ 75% with 2′ rest. Not ideal, but a reasonable compromise. What we simply can not do is ‘condition’ them with high volumes of low intensity aerobic work. This is a death march for sprinters, jumpers and hurdlers and has no specific value to their success. You must build a base for your sprinters, hurdlers and jumpers. But it should be a base of speed and power. Not an aerobic base. You can get away with a higher volume of lower intensity tempo runs with your 400/400h types very early in the season. But at the end of the day, speed is king. And speed must be trained year round. This means the bulk of work for your short sprinters (100-200), jumpers and sprint hurdlers must revolve around high intensity runs of 2 – 8 seconds with full rest, strength training and power development. So, regardless of the temperature, acceleration development must take priority over all other types of training. Therefore, on days where this type of work must be done, consider reducing the distance of the runs. Maybe I had 6-8 x 30m (and event specific variations) planned. If I’m afraid to let athletes go that far, we will do a high volume of 10 meter accelerations. Even in warm weather we do the bulk of our work at 10 meters. Because there is not a single athlete, on your team or mine, that can run 10 meters properly. And this first 10 meters sets up what will happen in every sprint race (400m included), hurdle race (yes, including 400h) and jump approach. Instead of going over 5 hurdles like I had planned, we’ll go over 2 or 3. I’ll just reduce the height and spacing so athletes are quick between/over hurdles and not straining/bounding between them. There are a myriad of ways to develop your sprinters, hurdlers and jumpers in the cold New England spring. But your program must revolve around developing speed and power, regardless of the temperature. Outside of the 400/400h (though still debatable), aerobic capacity/power development has little or no value to athletes competing in the 100, 200, 100H/110HH, long jump, high jump, triple jump or pole vault. When you train speed and power, your athletes will be able to express speed and power in competitions. When you train aerobic endurance or focus on ‘conditioning’, your sprinters, hurdlers and jumpers will not perform to the best of their ability. Best of luck this spring! To learn more about how I coach high school sprinters in less than ideal conditions, take a look at Complete Speed Training 2.